Finally-the ultimate diet for fast, safe weight loss, lifelong health, and longer life, based on more than twenty years of research and the latest findings on appetite and weight. Metabolic specialist Ron Rosedale, M.D., has designed the Rosedale Diet to regulate the powerful hormone leptin, which controls appetite and weight loss by telling the brain when to eat, how much to eat-and when to stop. New research shows that leptin may be one of the body's most important hunger control mechanisms. Control leptin, and you control your weight. Most people's leptin levels are out of control, causing them to overeat and to store fat rather than burn it. The only way to flip the "hunger switch" back to normal is through a diet high in healthy fats and low in carbohydrates, saturated fat, and trans-fatty acids often found in processed food-plus just 15 minutes of daily exercise. Dr. Rosedale's 21-day diet plan is simple: Just select from the many foods on his "A" list, including "healthy-fat" foods such as avocados, nuts, olives, lobster, crab, shrimp, goat cheese, Cornish game hen, venison, and more. Then gradually add foods from the "B" list, such as steak, lamb chops, fruits, beans, and so on. A 28-day menu plan and more than 100 recipes, such as Dilled Salmon and Fresh Asparagus, Gingery Chicken Soup, Lasagna, Black Bean Wrap, Raspberry Mousse Cake, and French Silk Pie, make eating the Rosedale way deliciously easy. Weight loss is just the beginning. 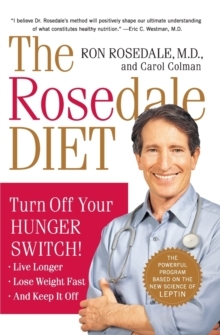 The Rosedale Diet will make you feel satisfied, reduce cravings, and put you in control of your "sweet tooth." It can even help eliminate or reduce heart disease, hypertension, diabetes, and other conditions associated with "natural" aging, as many of Dr. Rosedale's patients can attest. You'll find inspiring stories from them-and the power to control your weight and improve your health-in this groundbreaking book.